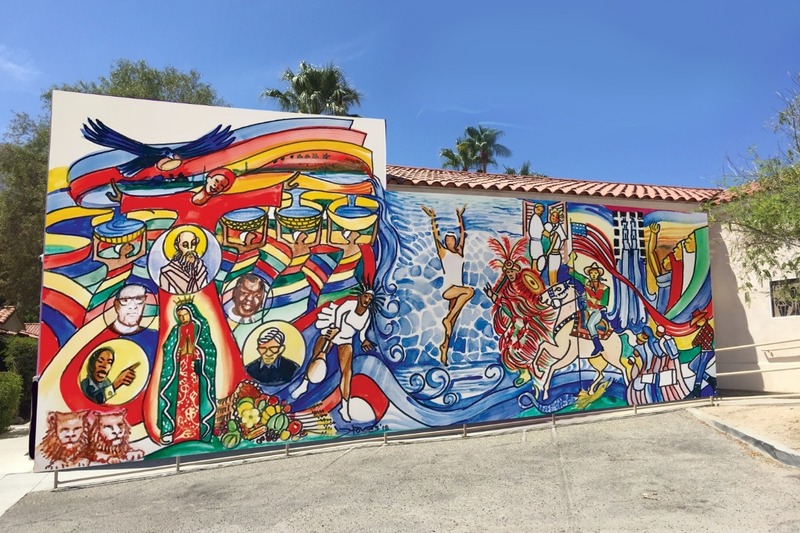 The Church of St. Paul in the Desert has been in Palm Springs for 80 years and has always been engaged with the community and the opportunity to collaborate with the Palm Springs Public Arts Commission to contribute to a neighborhood mural is ideal for making some of that connection visible. Palm Springs and the Coachella Valley are home to several peoples, who are not always honored or are not seen as connected to each other. 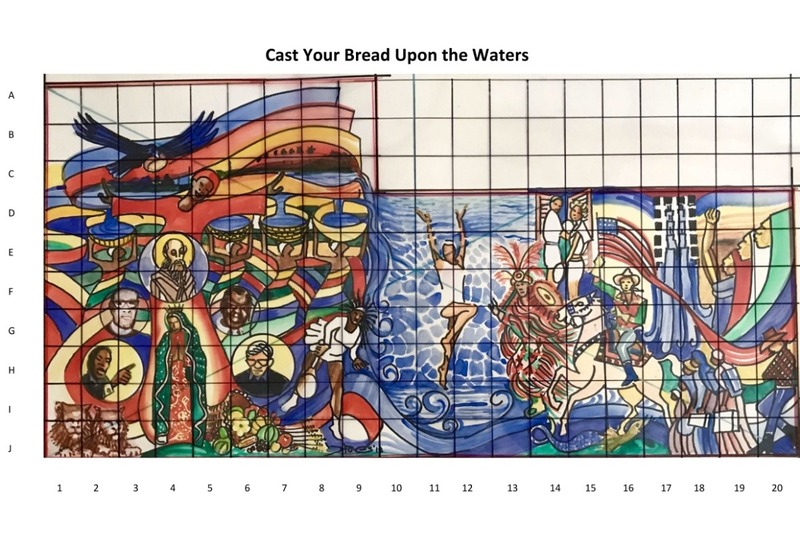 This mural, “Cast Your Bread Upon the Waters” by local artist Bernard Hoyes will bridge that gap, connecting the entertainment, recreation and agriculture focus of the desert through water, and acknowledging the Native People, the Mexican-American, and the African-American presence in our valley. The mural celebrates iconic images of St. Paul the Hermit, Water, Agriculture, Hollywood-Palm Springs connections and the images of three local clergy who worked with Dr. Martin Luther King, Jr. and on Civil Rights in Palm Springs. A lot of thought was put into the design of this mural, it was selected among several design proposals from local artists because of the multicultural representation and figures it displays that we hope will draw people in – to look and to look again. That is a major reason why I am excited about the Mural. It provides an invitation for people to come onto the St. Paul’s campus where they can be inspired, find a place to rest, and connect with the Holy as they understand it. - Andrew Green, Priest at St. Paul’s in Palm Springs. The process for painting the mural will begin on Tuesday, December 18, 2018. The finished mural will remain for at least two years and will be located on the South-East side of the church facing the Little Flower Shop. $60 a 4x4in signed print as a gift for your donation. $500 a print of the entire mural signed by the artist. $1000 a print of the entire mural signed by the artist and name listing displayed along with the legend of the mural. J-6 Horn of Plenty representing Valley Agriculture. C-5 Woman in Red symbolizing the Spirit. E-4 Icon of Paul of Thebes – Parish Patron Saint. 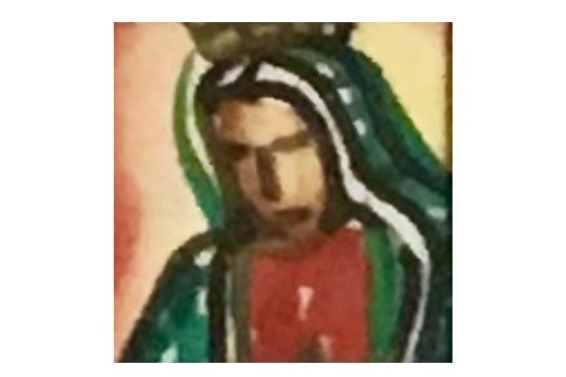 G-4 Our Lady of Guadalupe – Celebrating Latino culture. Four Faces: Martin Luther King, Jr. H-2; Rabbi Joseph Hurwitz, H-6; the Rev. Fred Barnhill, F-3; the Rev. Jeff Rollins, G-6 who worked in support of Dr. King for Civil Rights in the Valley in the 60’s. E-2-8 Four Water Bearers. Water is a big part of mural. J-2 Lions – Symbol of St. Paul of Thebes. The lions buried him. B-3 Raven carrying bread – Symbol of St. Paul. 1⁄2 “loaf” each day. F-16 Ironic St. George and the Dragon with Gene Autry on the Horse. A more recent, and iconic hero. H-18 Indigenous people of Mexico with colors of the Mexican Flag, connecting with colors of the American Flag. D-14 George Montgomery and Dinah Shore – Icons of Palm Springs’ golden age. F-13 This figure will be replaced with an approved Agua Caliente figure. G-9 Serena Williams – A recent participant in building the attraction of the Coachella Valley. The proportion of the painting to the mural is 1 to 24. There will be more space between features and some features will be reduced in size as the mural unfolds.